"When you met a girl from another factory, you quickly took her measure." An eye-opening and previously untold story, Factory Girls is the first look into the everyday lives of the migrant factory population in China. China has 130 million migrant workers—the largest migration in human history. 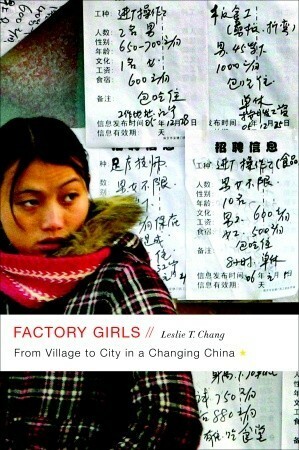 In Factory Girls, Leslie T. Chang, a former correspondent for theWall Street Journal in Beijing, tells the story of these workers primarily through the lives of two young women, whom she follows over the course of three years as they attempt to rise from the assembly lines of Dongguan, an industrial city in China’s Pearl River Delta. As she tracks their lives, Chang paints a never-before-seen picture of migrant life—a world where nearly everyone is under thirty; where you can lose your boyfriend and your friends with the loss of a mobile phone; where a few computer or English lessons can catapult you into a completely different social class. Chang takes us inside a sneaker factory so large that it has its own hospital, movie theater, and fire department; to posh karaoke bars that are fronts for prostitution; to makeshift English classes where students shave their heads in monklike devotion and sit day after day in front of machines watching English words flash by; and back to a farming village for the Chinese New Year, revealing the poverty and idleness of rural life that drive young girls to leave home in the first place. Throughout this riveting portrait, Chang also interweaves the story of her own family’s migrations, within China and to the West, providing historical and personal frames of reference for her investigation. A book of global significance that provides new insight into China, Factory Girls demonstrates how the mass movement from rural villages to cities is remaking individual lives and transforming Chinese society, much as immigration to America’s shores remade our own country a century ago. I don't know what drew me to this book; perhaps it was that I don't feel like I know very much about China in general (particularly modern-day China), and wanted to change that. Partly I selected it because it was available on my library's Overdrive site, and I wanted to select a non-fiction book, because I realized - and was appalled at the thought! - that other than autobiographies, I hadn't read ANY non-fiction this year! Unreal. Usually I have a non-fiction going alongside whatever fiction I am currently reading. Sometimes they complement each other, but usually they are simply two ways for me to look at the world. I enjoy stories, for sure - but I also love soaking up facts about the real world around me. I also chose this book because I thought it might be more about what we Westerners are always told are the horrific conditions in Chinese factories, as the workers slave away to make us the luxury goods we take for granted. And there was some of that - most factory workers are on 10- or 11-hour shifts, and only get every other Sunday off, for example. But the picture Chang painted wasn't that of despair and grueling conditions - rather, it was of a hopeful young generation of Chinese (mostly women, per the title) who take this factory work as an opportunity to better themselves and their positions in life. Many are the daughters of rural farmers, and become migrant workers in larger cities (many hours or days away by train) because there is no real opportunity for them in their hometown. They embark on very strange lives, which revolve around work and often involve jumping from one job to another. This is a place where resumes aren't very important, and lying about your experience is par for the course. Many workers get jobs that are beyond their level of expertise, but they essentially fake it till they make it! There are so many instances of opportunity of all kinds which are taken advantage of: Chang examines women who work on the factory floor, those who work as secretaries or at other higher levels within the factory, entrepreneurs trying to start their own streams of revenue in a very competitive city, those who choose to study English full time, and even prostitutes. Everyone has their place in this nonstop economy, and if they find themselves unhappy with their situations - either due to interpersonal relationships or ambition - they (seemingly) glibly move on to something new. It was fascinating to see the cavalier way many Chinese approached the job market: it appeared that they never worried, that there was always another job they could take. The author also tried to interweave her own family history in with this story, which I felt was done rather unsuccessfully - it felt somewhat forced. I found myself much less interested in these parts of the book, even though there were many fascinating aspects of her grandfather's story. Perhaps there was just too much of it, and I wasn't certain how it really fit in with the story of today's young migrants. My favorite parts of the book were probably those times when Chang traveled with the girls to their rural China hometowns. This was where you could really see the contrast between city and country life, and even still some of the after-effects of Mao's reign. Visiting the hometown alongside them, as the reader, you could really understand what this young generation is trying to escape. Not to say that it's necessary they should - many of the young women, once exposed to capitalism, certainly became more materially inclined (although not nearly to the extent that I am, I know) and who is to say they couldn't have carried on reasonably happy lives in the towns where they had been born? (Although, opportunity for such a life is rapidly disappearing, particularly for young women, so often it was necessary that they leave to seek their fortunes elsewhere.) But it definitely was a marked contrast, and one that is marking an important historical shift in Chinese culture. This mass migration to cities is a relatively new development, and it remains to be seen how these changes will affect China and the rest of the world. I am glad, at least, to be more aware of the situation.